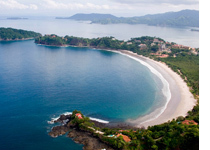 Written by Peter Conrad After some days staying at La Fortuna, I continue with my Costa Rica surfing vacation at the North Pacific in Guanacaste. I went to some beautiful places in La Fortuna, starting with the Arenal Volcano National Park, and enjoyed some of the tours that take place there, like the suspended bridges tour at Arenal, rappel at the la Fortuna waterfalls, kayaking and windsurfing at the Arenal Lake, and many more that have made a great Costa Rica travel adventure. On my previous trip to Guanacaste, I went to Playas del Coco, Nosara, Ostional, and some of the breath taking volcanoes at the Central Divide. Guanacaste is such a big province, and there are so many places to know, that I’m looking forward to go back to the coast. I’m starting at Flamingo Beach, a classy place located 90 minutes from Liberia. You can get there by taking a public bus, private shutter or driving a rental car. The road is paved and in good conditions, and you can go to other beaches from there, like Potrero and Brasilito. Flamingo is inside a bay, and it is a white-sanded beach with clear, pristine waters. The water is warm, and the place is very clean. It’s perfect for deep sea fishing, with a great variety of species, like marlin, swordfish and tuna. An international fishing competition takes place every year during the summer, making Flamingo a very popular touristic destination. Flamingo also has a fully fledged marina, and a wide array of possibilities for water Sports, such as scuba diving, diving and sailing. I did the scuba diving tour, swimming with the rich marine wildlife, including White-fin sharks. It was an amazing experience. If you look for a place to rest with style, Flamingo is the right place. You will find some of the finest Costa Rica luxury Hotels, villas and condos, and there’s an 18-hole golf course for the sport lovers. You will have a great time at Tamarindo, contact your Costa Rica travel agency and get to know this charming place.